When I developed this recipe and photographed it the weather was glorious! The sun was shining brightly, it was warm and it was finally starting to feel like Spring. However, as I type this now it is cloudy, a bit cold and looks like it is going to rain. 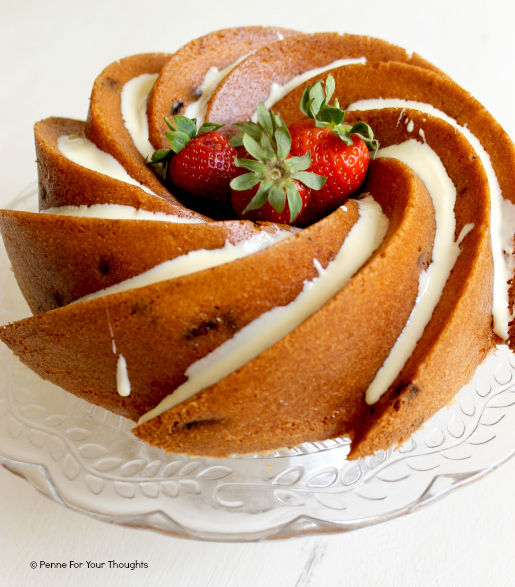 Once the sun starts shining again, this beautiful bundt cake recipe would be a wonderful dessert for garden parties, BBQs, or a cheeky Sunday afternoon tea and slice of cake break. The tin was bought from Lakeland with my birthday vouchers, but you could also use a normal bundt tin if you don't have the swirly one, although I am in love with the pattern and shape of cake it makes. Don't make me tell you the price I paid for it. A light, fluffy sponge filled with dried strawberries and lemon juice, and then drizzled with white chocolate transports you to summer in just one mouthful. In a freestanding mixer beat together the butter/marg, sugar, eggs, caster sugar, flour, baking powder and milk together until well mixed, light and smooth. Melt the white chocolate in the microwave or over a bain marie and then drizzle over the top of the cake. 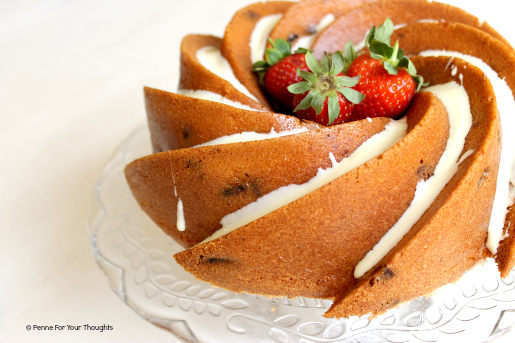 Top with fresh strawberries to decorate. This is such a snazzy cake!!! Next time we have a BBQ this summer i'm going to make it as I can just imagine tucking into a slice with a lovely glass of Pimms to wash it down - pure summer! What a pretty cake! Bundts always make such impact. 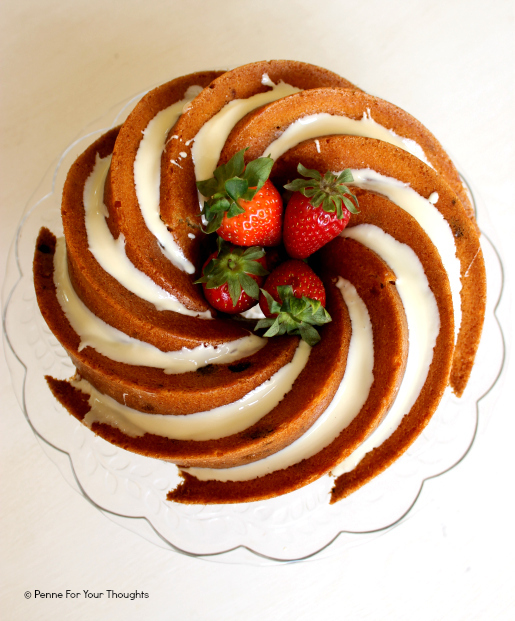 I dont have a bundt cake tin but this cake makes me wanna fun out and get one.